While learning Unity3D and developing my indie game for Android – Makura – last week, I was trying to set up a button to take a screenshot and share the image opening the default list of Android of the current social apps installed on the device. I have been stuck for a while, getting errors using AndroidJavaClass and AndroidJavaObject on Unity to call the Java classes of Android. Once I solved the problem I wanted to share the code on my blog, because I couldn’t find anywhere a solution. The exact problem was including the jpg of the screenshot as uri for the EXTRA_STREAM parameter of the Intent java object, and let it open properly with other apps. I hope this could help someone else! Don’t hesitate to leave me a comment with your experiences or questions! Finally I had the time to make an example project for this utility. I’ve heard that some of you had troubles to make it work, so I decided to create a kind of tutorial and share it so you can download it and test it! My computer runs Windows 7 64bit, Unity Free 4.3.4f1, Java jdk1.7.0_55 and jre7. At the moment the code is working perfectly, inside the zip file you can find “ShareTest.apk” to test the example on your device. Grant the Writing Access to External (SDCard) in PlayerSettings, otherwise you won’t be able to share pictures. Hi, this code works amazing. Thanks! You really saved me and my teammate. Nice work! Really wanna say thank you. Thank you, but be careful, it doesn’t work anymore on the latest Android OS (if I’m not wrong from version 7). You can target Android 6 and it works fine, but if you want to publish it, it won’t be accepted on the store anymore. Thx for your sharing script. 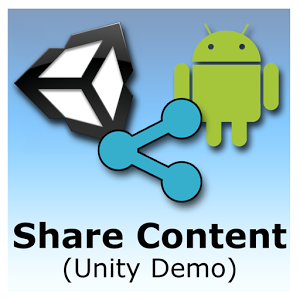 I tested it on my unity project,but when i clicked the button to share,it couldn’t share through Line and it would show Error Message,but other app like FB messanger it can share correctly. I’ve downloaded your App on the Play store,it can share snapshot correctly through Line. I checked everything but nothing help. I will be appreciated if you have any solution. It doesn’t work on Android 8. Works perfectly! Thank you very much! Hi, thx for the code. I took care to change the Writing Access to External, but nothing more happens on my Android device. I also look in the comments if someone had the same problem but found nothing. my phone does not have an SD card, do I need to change something in the code or unity to make it work for me? if you have an idea or a track I am a taker, thank you. it should work, but I didn’t properly tested on the latest android version, have you tried to install the app from the store? Great, I tested the demo with the link that you send me and it works perfectly. it only remains to integrate it into my app and it should work. Thank you very much for your help and sorry to finally not use your own code. it’s an old code, it needs to be updated 😉 but it’s a good start! Hi, I have a question, your code receive a callback when you share it? no, unfortunately this is it. Some apps share also the text, some others don’t. For example, on facebook, if you want to share also the text you have to use the facebook plugin for unity.